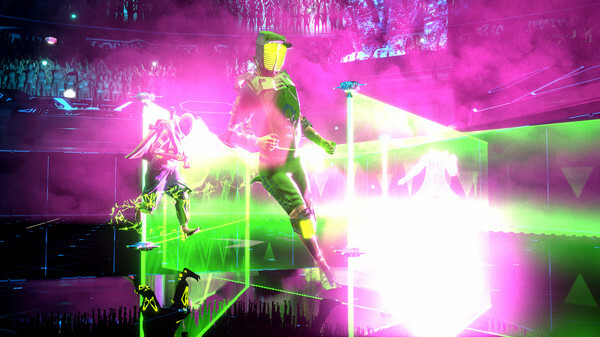 Laser League is a terrible name for a terrific game, a neon-soaked fever dream for the competitive multiplayer set, bringing people together on sofas and across internet connections to decide who is truly best at this bizarrely bloodless future sport. 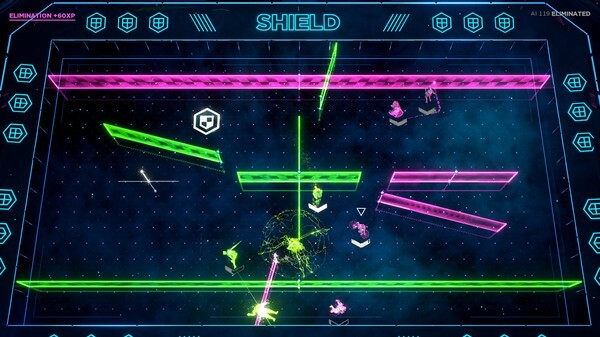 Laser League takes place in 2150, and small teams of competitors are fighting for control of arenas full of moving nodes which, when activated, project brightly coloured lasers that are harmless to the controlling team but lethal to the opposing players. 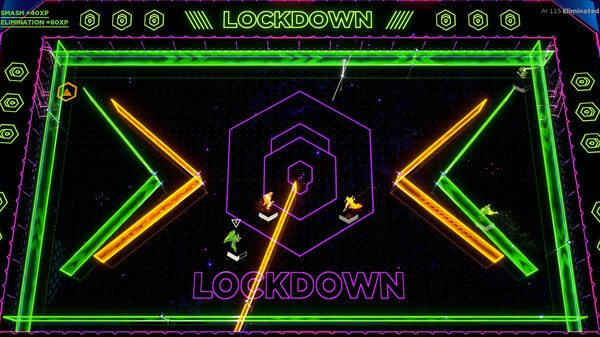 There's a lot more to the game, but at a simple level that's where Laser League is at: capture the nodes, occupy the map, and when you take out the opposing team with your frickin' lasers, you win the round. This simple surface level makes it easy to grasp at first, but the extra layers of depth mean it's surprisingly difficult to play with any degree of skill. 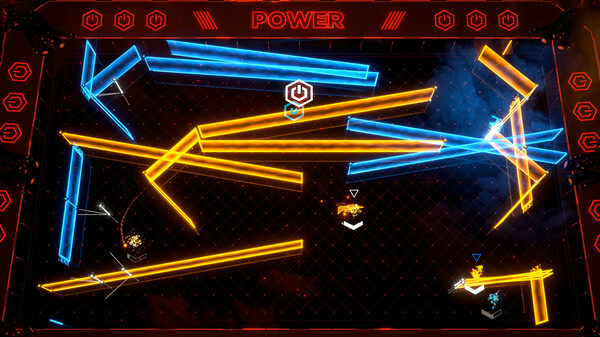 While it's ostensibly a sports game, in play you're dancing between laser beams like something out of R-Type, and early matches involve less of you competing with the enemy team and much more of you trying to survive against your own coordination and stupidity as the two mix to hurl you into every potential laser-themed threat on the map. Get to grips with the whole not-jumping-into-death-by-laser, and the rest of the game starts to open up around you, revealing a surprisingly deep set of mechanics. Subtle elements emerge over time: There's a class system with modifiers, meaning you can play a support role class that allows you to briefly phase through the lasers to get to a downed teammate and revive them. Combine this with the medic perk, and every time you pick someone up, you'll instantly recharge your ability and be able to drift out of the treacherous lasers again. There are several classes, and each of them feel impossibly powerful when played well, with several different sub-abilities providing the depth. As with the classes, every sub-ability feels empowering in its own way, too. Couple this with the ability to go on the offensive by capturing nodes or defending yourself with your skills on the stick and the game is good at making you feel powerful. Occasionally, I'd be roasted by a laser that I was sure I hadn't touched, and occasionally I would miss an attack I was sure I'd lined up, crashing into the lasers and perishing as I cursed repeatedly. However, I was likely just mistaken. The game is difficult and brutal, but because of this I ran around my entire flat whooping when I pulled off my first Snipe attack that killed three people at once. The game is astoundingly well balanced when you consider that this is the first multiplayer game to come out of indie outfit Roll7, and while I have some affection for the studio's efforts with OlliOlli and Not a Hero, it's not a massive stretch to say that this is the finest game the studio has ever made. It shares a similar focus on movement as these earlier titles, and the same visual flair despite the slightly spartan aesthetic, which is of course necessary to see the lasers careening towards you. If it's a change for Roll 7, it's a change for video games in general too. Laser League, a game perfectly honed to be played on the sofa with a group of hollering friends, is a welcome return for the concept of split-screen multiplayer, but also shows that the minimum viable product expected in a video game is changing too - single-player content is nice, but no longer essential. My first review for this website, several years ago, was Rocket League, and I marked it down for having a disappointing single-player offering. That was, undoubtedly, a mistake, as the game went on to conquer the world of casual multiplayer, but it was nonetheless how I felt at the time the game launched. 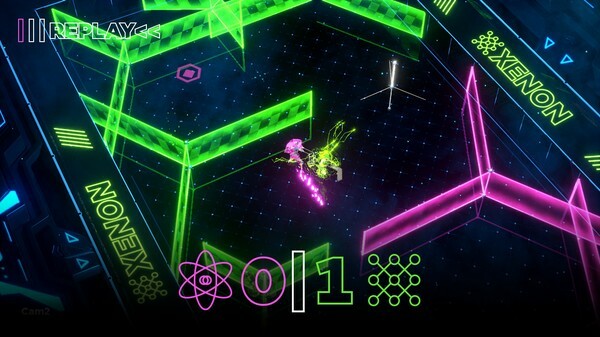 Laser League is similarly light in terms of single-player features, and even lacks the prospect of a ranked online multiplayer mode, merely offering up cosmetic choices for progression. However, the game doesn't feel any weaker for it. This is a game that you play with your friends when they come over, or hop on for a quick bash in a snatched 20 minutes. The game can be played for long sessions, but it is at its best when it's short and sweet, and watching it being played is often as satisfying as playing it yourself. This review has sat percolating in my head for a week, and I think that while it isn't solely down to Laser League, the game is nonetheless emblematic of the way the games industry is changing to become more diverse. 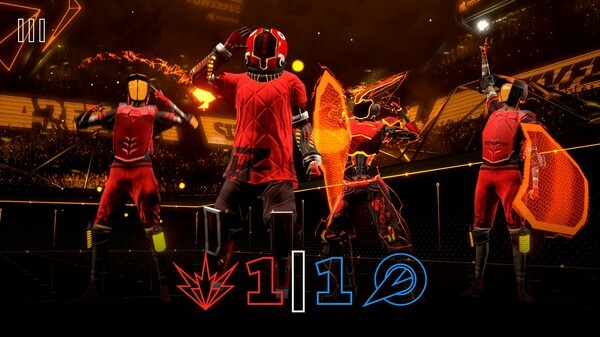 I realised that I adored Laser League within moments, but it took me a little way to come around to the fact that despite its failings - most of which are borne out of the sheer lack of "content" in the game outside of the core loop - it's a phenomenal multiplayer title and deserves your attention if you have the friends to plug into it. Viewed through this lens, Laser League is a roaring success for a tiny studio, and although player numbers are currently low, if you can bring your own collection of friends to the party it's a worthwhile endeavour.